Herman Frank has clearly been a busy man recently. As guitarist for Accept he'll have been busy working on their latest album, Staligrad, which was released in April, and has also been busy on his latest solo album - "Right in the guts". As a member of Accept he's been one of the top metal guitarists in Germany since the early 1980's but is also a producer who has produced albums by bands including Saxon, Rose Tattoo and Molly Hatchet. The album kicks off with "Roaring thunder", and the track certainly lives up to its name, opening with a wall of sound from the electric guitars and the relentlessly fast pounding drums. This is a fast, heavy metal track that really gets things off to a superb start. 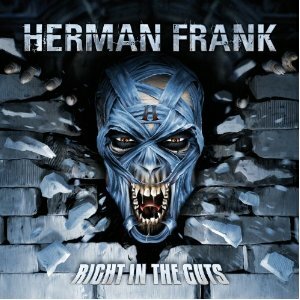 "Right in the guts" is another powerful track - At Vance frontman Rick Altzi has a superb voice and this track lets him show off some of its power. "Falling to pieces" is a slower track and the vocals really do remind me of a young David Coverdale during this song, and this gives the song a real old-school Whitesnake feel. This is an excellent album that's easily the equal of his work with Accept. The vocals really are excellent and varied - Rick Altzi is able to handly the slower songs and fast ones equally easily, and the guitar work is as you'd expect absolutely superb. The album is hard and heavy and packed with great songs - a must for all metal fans, and especially fans of Accept.